It's an amazing book and I love it! I wish Red Tabby and Dylan really existed because they're so wonderful and I would love to get to know them. You are one of my idols and I think your writing is brilliant. In my English class we had to put up a picture of our favourite author so I want you to know I put up a picture of you! Martha. 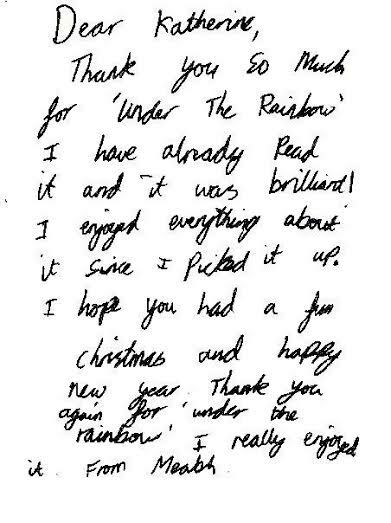 I absolutely loved Under the Rainbow. I loved the start, reading about the excitement of the show! When Dylan was on the highway it was so thrilling I couldn't put it down. I really liked the fact that there isn't just one high point to the story; it didn't just finish with the Golden Flame Awards, there as so much more to come. It was really good that everything was back to normal for the Christmas Spectacular, and that they had a happy ending. Grace. I have read your third book and it is brilliant. I think it is a really good twist on the story lines of the earlier two books. I really enjoyed the characters going to Hollywood. I can;t wait for the book to be published. James. Thank you for writing such a wonderful story. My granddaughter in New Zealand re-tells all the adventures to me on Skype. Precious moments shared and much enjoyed. Many, many thanks. Joanna. Parents enjoy reading about Dylan and Red Tabby just as much as the kids. I am going to re-order as my first two copies have long gone. Day Ravenscroft, USA. I love your book so much because it is exciting and I never want to stop! It makes me feel like I'm there doing it too, it makes me feel happy, surprised, shock and great just reading it. I love animals so it's fun to read, I really hope you do another books soon and please tell me if you do, so I can buy it, that will be great! I think your book is one of my favourites. Hope to hear from you soon. Sophie, Yorkshire, UK. I have finally finished 'Born To Dance' and thoroughly enjoyed every page. It is now doing the rounds of my great-grand children who I am sure will enjoy it as much as I did. Joan Hughes, Ontario, Canada. Born to Dance was a brilliant book. I would definitely recommend it. I really enjoyed reading this book as I never knew what would happen next. I liked how you explained each character's personality. I also like the names as they were different to normal names. I could see each character clearly in my mind because of how you explained them. Bethany, Somerset, UK. Hi Katherine- I read Jess chapter one on Monday (partly because I was interested). He liked it SO much that he asked at school the next day if he could swap the Alex Rider he was reading for Born to Dance!!!! Yesterday he updated me on the plot and said he will keep doing that. So it is definitely a big hit. I think the plot is progressing at a great pace for him and he talks about the animal characters as if he knows them. Jacqui, London, UK. It's been a long time since I've read a children's book except the kind I read to my grandkids, However, I was pleasantly surprised to find that it was so much more than a children's book. Ages 8-80 should enjoy it. The book kept my interest the whole time and I was actually sorry when it ended. It's too bad in real life that more people aren't like the animals who showed so much friendship, determination and forgiveness. The way you described Dylan's dancing was so vivid. In fact, about half way through the book I was starting to wish the whole thing was on the big screen so I could actually see all the characters. I know my granddaughter is going to love this book. I found it interesting to see that there were a few words spelled differently than how we spell them. The illustrations were fabulous and I even noticed the slight curl at the end of Lion's mane from his pink rollers! All in all, this is a beautiful story and you've done a wonderful job in putting it all together. I'm thrilled to be among the first to read it.Sandy, California, USA. I simply loved it and couldn't put it down. A real page' turner. I was lost in admiration of your vivid imagination' and portrayal of animal characters and felt quite drawn' into their adventures. Sue, Wiltshire,UK. My copies of Born To Dance arrived a couple of days ago, I have just read and enjoyed it! And 2 of my younger friends will get it for Christmas. Tony, Montreal, Canada. You are a great example to be following your creative dreams in such a delightful and enticing way. Heather, Ontario,Canada. From beginning to end you kept us involved, with the series of climaxes and new perils which kept us turning pages to the end. The notion that the animals could talk to each other and plan and make strategy together was wonderful. And the interaction with the humans was great. Lots of interesting characters and a variety of gifts and talents. We think it is a cracker, and want to see the next one! Ray, Scotland, UK. A major enterprise! So many children's books are brief and anecdotal so it was a pleasure to come across one with such detail, so much sheer STORY! An achievement to be proud of- congratulations. Colin, London,UK.